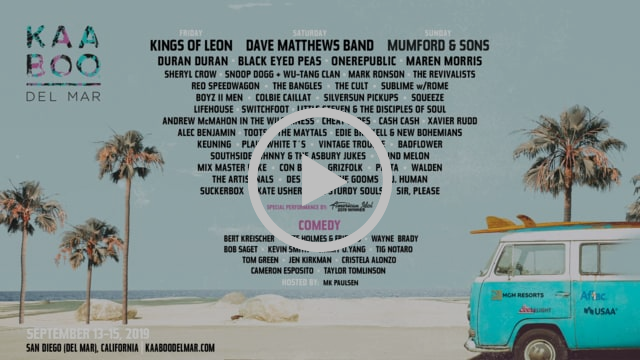 March 21, 2019 (Del Mar, CA) – KAABOO Del Mar has officially dropped its music and comedy lineups for its fifth annual event happening September 13-15, 2019. Nashville Rock chart toppers Kings of Leon, live music icons Dave Matthews Band, and British folk-rock luminariesMumford & Sons will headline on Friday, Saturday, and Sunday, respectively. They will be joined by a lineup of cross-genre hit-makers including Duran Duran, Black Eyed Peas,OneRepublic, Sheryl Crow, Maren Morris, a special collaboration from hip-hop stars Snoop Dogg + Wu-Tang Clan 25th Anniversary Set, plus Mark Ronson, The Revivalists, REO Speedwagon, The Bangles, The Cult, Sublime with Rome, Boyz II Men, and many more, including a yet to be announced special performance from the 2019 American Idol winner. Comedians Bert Kreischer, Pete Holmes & Friends, Wayne Brady, Bob Saget, Kevin Smithand more will lead the laughs on the HUMOR ME stage. A confirmed lineup is listed below. KAABOO Del Mar, KAABOO’s flagship event, is conveniently located at the Del Mar Racetrack and is celebrated as San Diego, CA’s largest multi-day major music and entertainment festival. For more information, visit https://www.kaaboodelmar.com/. In 2019 KAABOO expanded internationally with KAABOO Cayman, taking place February 15 + 16, 2019 in Grand Cayman, the festival celebrated a successful sell-out in its first year. Visit www.kaaboocayman.com for more details. KAABOO is proud to expand its brand in 2019 to AT&T Stadium in Arlington, Texas. On May 10-12, 2019, KAABOO Texas will host its inaugural event with all of the same elements that have made KAABOO Del Mar and KAABOO Cayman an international success. With the amenities and high energy found in the Dallas Cowboys’ home base, KAABOO Texas celebrates KAABOO’s elevated live entertainment lifestyle brand in the Lone Star State. For more information, visit www.kaabootexas.com.